"Alcoholism isn't a spectator sport. Eventually the whole family gets to play." 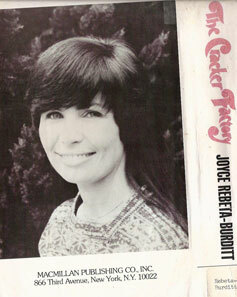 ﻿Joyce Rebeta-Burditt has enjoyed a varied career as a novelist, television executive, and series television writer. 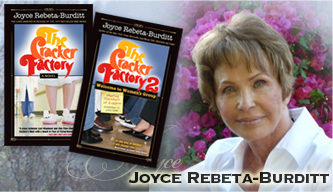 ﻿Joyce Rebeta-Burditt's THE CRACKER FACTORY 2: Welcome to Women's Group is the bookend to her first novel THE CRACKER FACTORY (1977), a national bestseller and ABC TV movie-of-the-week starring Natalie Wood and Shelley Long. SUMMER 2010 UPDATE: We signed the rights for BOTH books, released fall 2010! In 1968, main character Cassie Barrett was committed to a mental institute (as she lovingly deems "the cracker factory") for alcoholism. Now 40-years-sober, she is helping others at women's group meetings, and making readers laugh with intrigue as they ponder the identity of the author's famous Hollywood friends and foes. This is a TRUE two-part saga spanning 40 years, recovery, and Hollywood!